This is the third time we’ve featured this corner. This image was taken in 1933, when it was 33 years old and known as the Georgia Granville Building, rather than by the names of the developers. One earlier posts was taken after this, in 1970 when it was nearing the end of its life and the other in 1928. Many of the businesses have changed in only five years. In this corner shot it’s possible to see Con Jones’s ‘Don’t Argue’ tobacco store (Don’t argue: Con Jones sells fresh tobacco). Jones was an Australian; an ex-bookie who was successful in Vancouver in the tobacco trade, and sports-mad to the point of building Con Jones Park near the Pacific Exhibition Grounds for his lacrosse and soccer teams to play in. Darling’s Drug store ran around behind the corner store with entrances on both Robson and on West Georgia Street. Next door on Granville Street was Al-Walters, a men’s furnishing store. Al was Al Divire, and Walter was Walter Matoff. They didn’t last long here – in 1932 the store was vacant, and in 1934 it was I P Blyth’s optometrist store and Potter’s jewelers. On Georgia Street there was Winifred’s Lunch, run by Paul Udesen, open at 7am and closed at midnight. Beyond that was the Georgia Hat Shop, and the Packard Taxi Co had the last store (the only business who were in the Georgia part of the building in 1928). Upstairs the sign on the window says Anabelle’s, but there’s no business with that name in the city that year or the year before, and although the top floor window says it is the Lilas Moore Dancing School, the street directory says that had relocated to Hornby Street. The Maxine Beauty Salon was operating upstairs, one of three locations run by Miss M MacGilvray, including the location on Bidwell Street in the West End. One unit upstairs was in residential use; the home of Henry J Hickey, and his wife Vera. The building was designed by G W Grant for Benjamin B Johnston and Samuel L Howe, and we examined some of their background in the earlier posts. 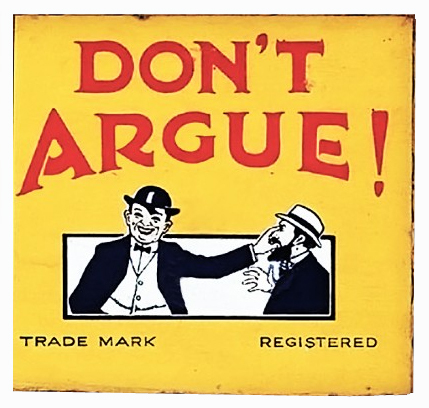 Ruddy-Duker had one of their many billboards erected on the roof of the building when painted signs and huge posters adorned many more buildings than they do today. Today there’s a retail frontage that forms part of the Pacific Centre Mall, with bronze office tower that was known as the IBM Tower for twenty years. Here’s a 1939 image of Burrard Street looking south from West Pender. The street had turned mostly commercial by then, having started life as a quiet residential street, but there were still vestiges of the residential past. On the west side of the street was a two-storey building built in 1910 by E W McLean and Arthur McEvoy. The biggest building in the picture is the Third Hotel Vancouver – the one that’s still standing today. Leading up to the hotel on the east side were a number of residential buildings, starting on the corner of West Pender with The Glenwood Rooms. They were completed in 1907, and W D Hansford was listed as the manager in 1908 clarified as William Hansford in 1910. William was aged 66, born in Clarksburg (West Virginia) in the USA when he married widow Alice Doster born in Wabash, Indiana, and aged 57 (Her father was Simpson Jones and her mother was Kezia). The wedding took place in BC in 1907, and there’s no sign of them in the city before the year they got married. We were reasonably sure that the building was designed by Honeyman and Curtis for Mrs E Charleson. This would probably be Eliza Charleson, who lived on Haro Street with her husband Donald in 1911. In 1904 this was the location of their house. Their son Percy was still living at home – he’s the same Percy Charleson who worked on Pender Street and who operated the first stock exchange in the city. Donald developed a building on Granville Street, also designed by Honeyman and Curtis. He was born in Quebec and came to Vancouver in 1885, working in the shipping and lumber industries. In 1889 he was awarded a contract to clear the south side of False Creek by the Canadian Pacific Railway Company, and was one of the founders of Christ Church. We’ve been able to confirm that J J Honeyman obtained the building permit for the $20,000 building here in August 1906. It was for Mrs E Charleson, and it was built by Bedford Davidson. William Hansford almost certainly died before 1911 as the proprietor became A R Hansford and Alice Hansford was identified in the 1911 census living with her lodgers and niece, Marie Jones. In the census there were 40 lodgers living in the building, with a huge range of employment including an American capitalist and his wife, F W Liddle and R M Ward who were both musicians, Mr and Mrs T F Curror, from South Africa, who had no employment, Harry Davidson who was a brickmaker and Mr and Mrs M C McQuarrie – he was a barrister. At the end of the block, on the corner of Dunsmuir, was the Young Women’s Christian Association building, built in 1905, added to by Dalton and Eveleigh in 1909 and again by Coffin & McLennan in 1913. In between are a number of houses that were already built by the end of the 19th Century. Like Glenwood Rooms would be later, the houses were occupied by a range of professions in 1896: James Harling a cigar maker, A P Judge, a solicitor, Dr Mansell, a dentist, D M Linnard, in real estate, William Kent, who co-owned the Criterion Saloon in the Dunn Block and Captain Reveley and his family including his son, a clerk in a solicitor’s office. Captain Reveley was apparently an agent of marine for the Provincial Government before moving to Vancouver. He seems to have died in the late 1890s, but his widow, Kate, continued to occupy the house. By the time this picture was taken in 1939 the Glenwood had become the Egremont House Rooms, run by George Robertson who lived there with his wife Marion. Some of the houses were also run as rooms – Mrs L J Shepherd ran rooms at 520. Mrs L Ritchie was living at 530, Mrs M Matthews at 534 and Mrs M V Adams had rooms at 540. W L Howie ran rooms at 544 and G H Stoneham at 552. Today, closest to us is a Manulife office completed in 1985, designed by Webb Zerafa Menkes Housden Partnership. Next door is Musson Cattell’s Bentall 5 tower, completed in two vertical phases (the top 11 floors in 2007 four years after the lower 23 floors). Across Dunsmuir Street is the rose coloured Park Place tower, also designed by Musson Cattell thirty years ago. We saw this corner in 1956, when there was still a building here. And we just posted the story of the garage that was built next door, to the south, in 1930. Here’s the view in 1965 when Walter E Frost recorded the mostly cleared site awaiting the construction of the Bentall Centre. 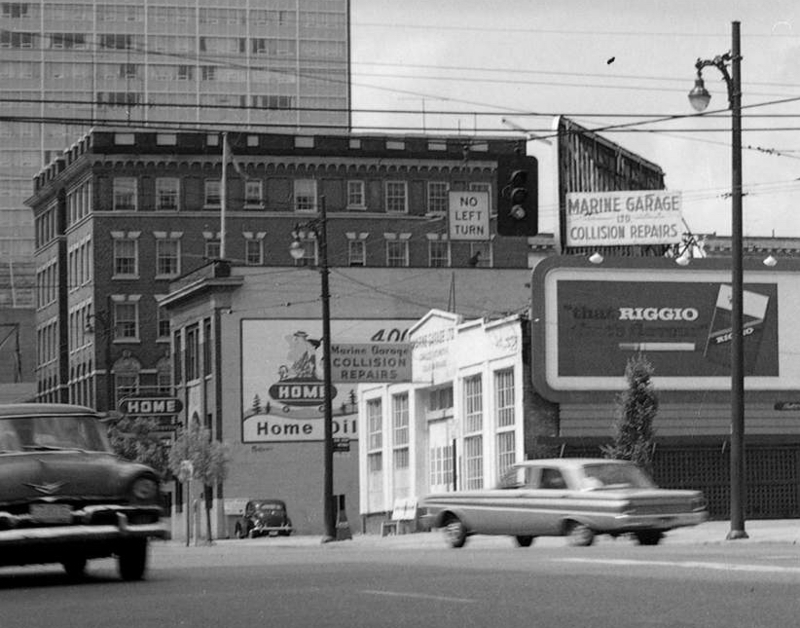 The Marine Garage was Ltd was offering collision repairs, and down the road was 555 Burrard with a variety of mining companies in office space upstairs and Home Oil occupying the main floor (and the advertising space on the side of the building). Beyond Eveleigh Street (which used to come through to Burrard Street) is an apartment building completed in 1912, designed by Kennerley Bryan for B T Rogers. Rogers was the Philadelphia born sugar magnate who created BC Sugar and also developed the Glencoe Hotel. As far as we can tell these were his only commercial investments; his only other developments were his home on Davie Street, Gabriola, and his later amazingly expensive Granville Street home, Shannon. He was said to have been a very cautious investor, and avoided jumping into Vancouver’s development frenzy – which might help explain the $1.2 million estate he had on his death. Here’s another image showing Burrard Street turning from a residential street to a commercial one. This is W L Frost’s garage near Pender Street, photographed in 1935 but built in 1930. Joseph Pyke was born in Enterprise, Ontario, and his wife Eleanor (who was quite a bit younger) in Perth, also in Ontario. In 1892 Joseph moved to Vancouver, sold boots and shoes and lived on Cordova Street. In 1896 their first son, William was born, and a year later another son, Fenwick. Two years later there was a daughter, Mary, and two years after that another son, Marshall. When Fenwick was born Joseph’s store was on West Hastings Street and the family were shown in the 1897 Directory as living at 825 Hornby, but they moved just before Fenwick was born to 529 Burrard, a new house on a quiet tree-lined street that may have been designed by W T Dalton (there’s a Dalton house built in 1901 on part of the lot, and others a couple of years later designed by Parr and Fee). The family stayed at the Burrard address for many years. Joseph started working for the government in 1913, as a clerk in the Land Registry Office, and in 1924 he moved on to a new post as a clerk in the Court House. In 1926 he retired, and in 1928 Fenwick is living at home, working as a clerk, and so was Marshall, working as a mechanic at the cannery of Canadian Fisheries. A year later Joseph had died (in 1928, aged 71), but Eleanor was still at the Burrard house and so were her two sons, Fenwick and Marshall. In 1930 the listing had changed to the Marine Garage – not too surprising a choice of name as the Marine Building was completed very nearby in that year. Maybe it was the confusion with a similarly named establishment on Marine Drive, but by 1935 (when our photograph was taken) it was known in the directory as Larry Frost Ltd, although the Marine Garage name was still on the building. In 1930 when it opened it was listed as being owned by Frost and McLaren; listed (inaccurately in Mr Frost’s case) as Jack Frost and David McLaren. The permit for the garage was listed after incorporation of a larger Vancouver, when the ledger no longer identified the architect, but thanks to Patrick at the Heritage Vancouver Society we know the builder was Kenneth M Skene and the owner was E M Pyke. The building cost $8,500, and when it opened, the manager was Fenwick Pyke. Eleanor and Fenwick Pyke initially moved to Thurlow, and Marshall was there too but Fenwick had moved on by 1931 to live on Granville Street. We’re guessing he developed tuberculosis, because his death was recorded in 1933 when he was only 34 years old in Tranquille – known for its sanitorium. Eleanor and Marshall moved to an apartment on Beach Avenue but Marshall seems to have moved on by 1938 and Eleanor moved again in the West End, dying a decade after her son Fenwick, aged 77. We’ve seen the garage way at the back of a 1956 image, next to the stores built to the north of the garage. Although Mr Frost was knows as Larry, he was actually William L Frost, born in New Brunswick. He worked for General Motors for 20 years and arrived in Vancouver in 1925. Mr Frost served with the Ordinance Corp during the First World War, and after the Second World War moved to Halfmoon Bay on the Sunshine Coast where he co-owned the Redroofs Resort for a few years before returning to live in Vancouver, where he died in 1953. The garage continued to operate as the Marine Garage, at least until the mid 1950s. Today that stretch of Burrard Street is part of the block with the four Bentall Centre Towers. The garage was located almost exactly between the first two towers, built in 1967 and 1969, designed by Frank Musson. Here’s the new property occupied by The Battery House on Burrard Street as it appeared in 1921. The building first appeared in the 1922 Street Directory, and the Battery House were the first occupants (so this was probably taken to record the new premises). We thought the Battery House were the developer as the company was incorporated in 1919 with a value of $150,000, although it had existed as a business in leased premises for some year before this. However, we now know that the building permit from 1921 identifies W E Anderson as the owner, and A Rodger as the builder of the $9,500 structure. Mr Rodger was probably Archibald M Rodger, a contractor who lived at 1123 Comox in 1921 and 1121 Davie St in 1922 (and a year later on W3rd – Mr Rodger seems to have liked moving). No architect is identified on the permit, but Mr Rodger seems to have been a contractor favoured by Townley & Matheson, as well as W F Gardiner and J A Benzie, so that may point to a possible designer. The most likely candidate as the owner was William E Anderson who moved to Vancouver from Victoria in 1921, to a new $20,000 mansion on Angus Avenue. He was president of the Hayes Anderson Motor Co, at the time newly created truck company based on Granville Street. The company were still here in 1930, when the Manager was identified as William Izett Walker and this building as their general office, Warehouse and Service Station. Mr Walker was born in Glasgow in 1878 and married Elizabeth Macfarlane from Sterling, Scotland in Vancouver in 1913 (presumably a relative of his second business partner P M Macfarlane). Mr Walker appears to have arrived in the city around 1910; he was still listed in an Edinburgh Directory in 1909 and first appears in the Vancouver Directory in 1911 His first business partner, William Ure, seems to have switched from a career in real estate where he initially worked for his father, John Ure, the family having arrived in 1908. In 1931 The Battery House seem to have down-sized, sharing the premises with The Bell Garage, and a year later the building was home to the Canadian National Garage and the A A Brake Shop. Presumably Mr Walker sold up, as he continued to be listed as an electrical engineer. He died in 1948. This wasn’t the first building on the site – there was a house built here around 1896, when the street was still almost entirely residential in character, which seems to have been demolished in 1920. We’ve posted an image of one of houses to the south, owned by jeweller C N Davidson (when the street numbering was slightly different), and the other side of the street. Today it’s a four-storey retail and office building completed in 1993 and designed by Musson Cattell Mackey. We saw what this corner of Pender and Howe looked like in 1947 in an earlier post. The building was erected in 1903 to the design of W T Whiteway for James Reid, who also constructed it at a cost of $19,000. The Pender Hall was upstairs. This 1919 Vancouver Public Library image shows that it was for a while part of the ever-expanding number of buildings associated with Downtown Vancouver’s love of motordom. The Battery House first appeared at this address (808 West Pender) in 1916. When this picture was taken the business was run by P M Macfarlane and William Walker, and before they moved here the business was located on Richards Street. Before that Mr Walker was in partnership with William Ure, and in 1912 they advertised as Electrical and Mechanical Engineers specializing in Storage Batteries. The company only stayed at this location for five years before moving to Burrard Street. Before the Battery House moved in, the corner was first occupied in 1905 by a grocers run by John F May. The Pender Hall had its entrance next door and F P Bishop sold wallpaper next to that. The same occupants were all still there in 1910, although Mr Bishop was now in partnership as Bishop Gaskell Co, paperhangers. By 1915, (before the Battery House moved in) the entire building was vacant as the city saw a continued downturn in the local economy. These days it’s a 1978 15-storey office building designed by Underwood, McKinley, Wilson and Smith. We have already detailed the story of the city’s new Public Library built in 1954. The basic structure is still there today – although altered by James Cheng’s redesign for HMV records and CTV in the 1990s, and again more recently for Victoria’s Secret. Of course, a 1950s building wasn’t the first structure on the block, and like both the opposite side of the street and the south-west corner there were single-storey stores here. We saw them in an earlier post from 1925 when the roof of the building was a series of hoardings. By 1951, not long before they were demolished, there was only one hoarding left – and that didn’t face onto the Robson and Burrard corner. It looks as if the building was already running down by the time the photo was taken.The corner unit was already vacant. Gracey’s cafe was next door, and G H Grant sold real estate from 975 Robson – and shared the address with ‘The Dory’ who sold used clothing (from the right hand window). The next unit was also empty, and J Pickford, a tailor operated from the next store. The next to last store in the row was Speer & Lamont ladies’ accessories, and the Coca Cola sign was where three businesses all squeezed into one store; Robson Billiards (presumably at the back of the building), W P Brown’s shoe shine stand and Red’s Barber Shop.